New details are starting to emerge about the next generation Mercedes-Benz E-Class (Code named W213) scheduled to be released in 2016. 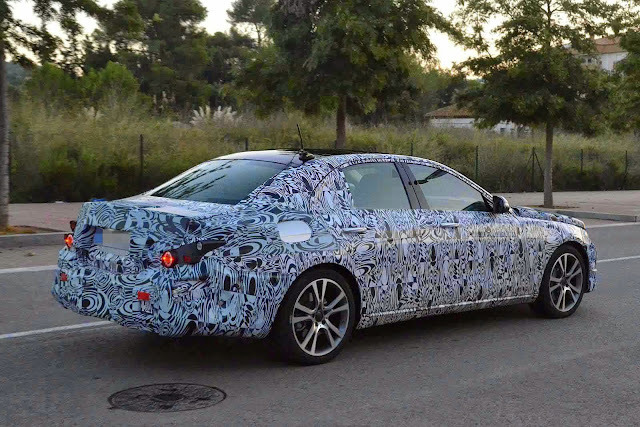 Mercedes is busy putting the finishing touches to its new 2016 E-class, which ushers in a new era of straight six engines, self-driving tech and hybrids galore. According to CAR MAG, the upcoming E-Class will lose between 70 - 150 kg (154 - 330 lbs) as a result of making the switch to the modular rear wheel drive architecture (MRA) which makes extensive use of aluminum and is sourced from the smaller C-Class. There’ll be significant changes under the hood. Mercedes will start phasing out the V6 engines in favour of brand-new, cheaper-to-build modular in-line six-cylinder motors in petrol and diesel form which are closely related to the corresponding fours. Out first is the 2.9-litre diesel six, which develops 313bhp in twin-turbo guise and over 400bhp when motivated by four chargers, two of them battery-driven. At the bottom end of the E-class range, we find a new 122bhp 1.6-litre four-pot, which is said to average 99g of CO2 per kilometre. You should also know that it's been 10 years since an inline six-cylinder engine sat up front in a Mercedes-Benz road car, but the straight-six shooter returns with the 2016 E-Class. Here is the part you don't want to miss, the new 2016 Mercedes-Benz E-class is set to become a true tech showcase. The onwards march towards autonomous driving will be furthered by the E-class’s stepping-stone technology. The car will park itself - by your phone in confined spaces and it also comes with gesture control, auto-pilot style cruise control that steers on the autobahn and augmented reality in the head-up display. Mercedes will launch 10 new plug-in hybrids (PHEVs) by 2017. Among them are three E-class derivatives: a mix of 2.0-litre four and 82bhp e-motor, a US-only blend of 3.0-litre V6 and 109bhp e-machine, and a still-to-be defined Europe-only PHEV diesel which will be added later in the lifecycle. Yea that's right, the art of driving is racing into a new era and Mercedes is sure doing a whole lot to champion the race.